Easter is just around the corner. This means scavenger hunts, coloring eggs, chocolate treats, and maybe even meeting the Easter Bunny! This Easter, The Lunch Mob wants to start off your kid’s Easter break with some fun. 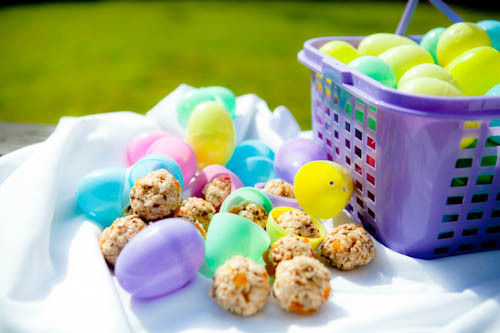 In the days before Easter break, we will be handing out our Puffed Rice Snowball snacks – a healthier alternative to rice crispy treats – inside of plastic Easter eggs. These treats will be included in your child’s lunch, in addition to a basket that will be left for the first 60 kids to pick from. These healthy but delicious treats will motivate your kids to be the first at school in those dreaded last days before a break. The Lunch Mob family is glad to be a part of your Easter celebration this year. Happy Easter! There is a nationwide kick to get kids eating healthier in schools. And yet, the available choices just aren’t good enough to satisfy their tastes. No question there is great value for kids to eat whole foods that are NOT pumped up with preservatives and junk. By truly focusing on the ingredients and how they are put together, we made it OUR mission to create fresh meals that kids love, with the nutrition that kids need. The Lunch MOB. Copyright 2017. All Rights Reserved.